Do you want to buy your partner a ring that symbolises fire, love and passion? Or do you want to pamper yourself and imagine yourself as a true queen? A ring set with a fiery ruby is exactly what you are looking for. Find your perfect ruby ring in our extensive collection. Do you also adore other coloured precious stones? Take a look at all our jewellery with rubies, sapphires and emeralds. When should I buy a ring with a ruby? A ruby ring suits many occasions, but there shouldn’t even have to be any occasion at all! The ruby is associated with courage and a fighting spirit, but also with passion and love. As a result, the deep red stone is used more and more in engagement rings, alone or with diamonds. Some special occasions, however, a perfect for a ring set with a ruby. The 40th wedding anniversary is also known as the ruby anniversary, although depending on where you are from, that could also be the 35th anniversary. Whoever is born in July should feel very lucky. After all, the ruby is the birthstone for this summer month and therefore the perfect birthday present. Which precious metal should I choose for my ruby ring? Pairing the different precious metals with a ruby creates a unique effect. The combination with yellow gold makes for a beautiful vintage look. 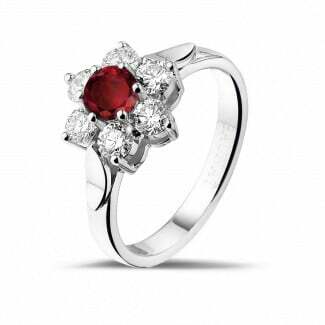 The ruby is sure to attract admiring glances when set in platinum or a white gold ring. The colours of these precious metals highlights the passionate character of the stone even more. 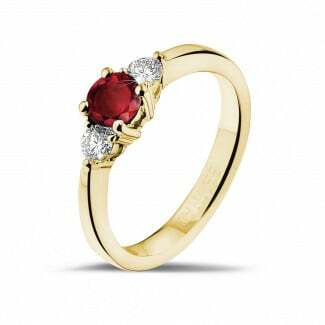 A red gold ring with ruby might be a less obvious choice, but it is certainly not less beautiful. And because fewer people consider it, it is a very original choice. Which other jewels go hand in hand with my engagement ring with a ruby? Discover it on our blog or ask the BAUNAT experts for advice via mail, chat or telephone.